Available now price, £14 in the hall, £20.00 by post Europe, £22.00 RoW. 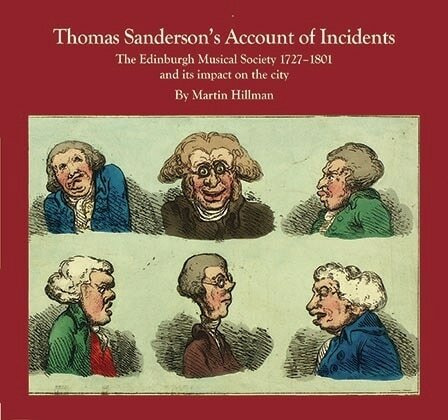 Buy Thomas Sanderson along with Temple of Harmony for the reduced price of £20 plus post and packing – Full details here; Prices here. Published in 2011, it is by Joe Rock, Martin Hillman and Antonia J Bunch. It describes the details of the hall's construction, decoration and improvement. It then brings the story right up to date – the University of Edinburgh restored it to its original use in the 1960s. Click on books. For the more technically minded, we have John Barnes's book Making a Spinet by Traditional Methods, and photographs of instruments in the collection, plus data sheets. Click on books. Our CDs, include three offering a range of contemporaneous music played by John Kitchen on instruments from the collection at the St Cecilia’s Hall Museum. Our well-known guide to all the instruments in the collection is out of print but is to be updated. We have a wide range of technical drawings of keyboard, plucked string, woodwind and brasswind instruments suitable for those wishing to make their own. For keyboard instruments, we also have detailed photos and datasheets offering detailed technical information of keyboard instruments in the St Cecilia's Hall museum. use the links above or click on the buttons, right . The drawing of the Andreas Ruckers 1630 6-voet virginal in the Musical Instruments Museum in Brussels is back on sale. Most of our own items will be on sale at the hall during opening hours once refurbishment is completed. This is scheduled for late 2016. They are all available by mail order. For our sales lists, click on the buttons alongside, or click here for our prices page which also includes helpful information on how to order and and how pay. Click to get to the website of the Historic Musical Instruments in the Edinburgh University Collection. To go straight to the order page, click on the link depending on whether you are a UK buyer or an overseas one. Have you considered becoming a Friend of St Cecilia's Hall ?